Naturalists in Africa have long noted that some lions in Ethiopia look a bit different than regular lions, mostly on account of a dark mane that extends from the head, neck, and chest to the belly. They're also smaller and more compact. It wasn't known, however, if they represented a distinct species. But now, a genetic analysis conducted on a group of these lions found only at the Addis Ababa zoo has shown that they are in fact a genetically distinct species — a discovery that has prompted immediate conservation action to preserve them in the wild. The researchers, an international team led by the University of York, UK, and the Max Planck Institute for Evolutionary Anthropology, Germany, compared DNA samples from 15 Addis Ababa zoo lions (eight males and seven females) to breeds found in the wild (six distinct wild groups). Analysis of both the microsatellite and mitochondrial DNA indicated that the zoo lions are genetically distinct compared to their wild brethren. 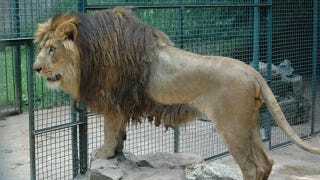 Consequently, the researchers have declared the lions to be a distinct species. They are urging immediate conservation management actions, including a captive breeding program. The researchers also note that their examination of the genetic diversity of the captive lions showed little effect of inbreeding — which is a good sign. Professor Hofreiter said: "A key question is which wild population did the zoo lions originate from and whether this wild population still exists; this would obviously make it a priority for conservation. What is clear is that these lions did not originate in the zoo, but come from somewhere in the wild - but not from any of the populations for which comparative data is available." The results of the study were published in the European Journal of Wildlife Research. Photos courtesy Joerg Junhold and Klaus Eulenberger, Leipzig Zoo.